Congratulations were due this weekend to Matt Polson who completed his 100th parkrun at Cheltenham by equalling his PB of 18:33 and coming 7th overall. Josh Hand came 5th in the same event with 18:19, and Eleanor Laney was 1st lady with 20:10. There was also a new PB for Peter Hooper with a time of 23:04 and for Jane Russell with 29:00. In Gloucester City parkrun another milestone was marked by Beverley Nolan who achieved her 50th parkrun. Lesley Cottle was 2nd lady to finish in Gloucester North with a time of 24:29 and Lynne Macedo was 2nd in her age group at Stanley Park, Blackpool. Members of Almost Athletes also took park in parkruns at Arrow Valley, Cirencester, Churchfields Farm, Chipping Sodbury, Exmouth, Forest of Dean, Kings Lynn, Newent, Pocket St Neots, Tewkesbury, Tychy in Poland and Worcester. Kev Fairs and his daughter ran the junior parkrun in Wimpole with a time of 15:30. 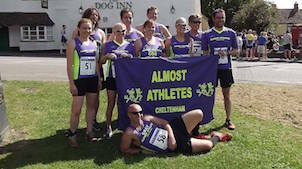 On Sunday 31st March, a group of Almosts took part in the Cleevewold 14 mile race at Winchcombe. Despite the challenges of this hilly, multi-terrain course, there was an excellent result for Shaun Carr who was 8th overall and 1st in his age group with a time of 1:49. Nick Spice was next Almost to finish in 2:16, closely followed by Simon Jarvis in 2:17 and Paul Wilkins in 2:19. Patricia Peever was first Almost lady with 2:18, whilst Hester Coggin was home in 2:19. Also running were Steve Taylor with 2:25, Mike Kennedy 2:30, Sarah Roberts and Debbie Minett 2:34, Karen Hilton 2:35, Victoria Kennedy 2:48, and Gail Wilkins and Maisie Markham at 2:52. The Cardiff Bay 10km race took place on Sunday 31st with Nicole Hope coming home in 57:24 and Wan Hartley in 59:54. Hannah Brown also took part in the Bicester Triathlon. A special mention is due for Almost member Paul Haig, who completed an astonishing 220km cross-country skiing event in Norway this weekend with a time of 28 hours and 23 mins. Earlier in the week on Thursday 28th March Allan Green ran another marathon at Dinton Pastures Country Park in Reading. He finished the 8 lap course in 5:14. On the same day Nikki Durnell took park in the Rogue Runs Off-Road Night Race of 5 miles at Chepstow Park Woods, and achieved a time of 45:56. With several Almost Athletes preparing for spring marathons, over fifty club members flocked to the region’s 20 mile races this week. Despite challenging and windy conditions, there were some impressive results at the Fission 20 mile race, Berkeley. The men’s team took third place, with Martin Foster leading the way for the club in 2:19. Matthew Hickman followed in 2:22, then Matt Barnes and Robert Dalton-Morris in 2:31. The ladies went one better, achieving second placed team with Kim Mansell first home with a PB in 2:41. Michelle Balchin was close behind in 2.43, and completing the team were Miranda Foster, PB 2:44, and Jeanette Gullick, PB 2:45. There were also PBs for Peter Mitchener (2:45), Anne-Marie Willicott (2:49), Mark Lyes (2:57), Lorraine Taylor (3:01), Clare Hearing (3:02), and Hannah Brown (3:38). Completing the distance for the first time were Richard Knightley (3:06), Maddie Page (3:25), Natalie Pluck (3:40), Oliver Clarkin (3:53) and Sarah Carr (4:00). Glenda Gill was pleased to finish in 3:30 after a long break from the 20 mile distance. Runners were cheered around the course by a crowd of Almost volunteers, who showed endless enthusiasm as they marshalled and manned water stations for hours in the strong gales. In the Fission 20km event, Matt Polson stormed home in 1:23, taking 4th place overall. He was followed by Dave Mayo in 1:56, Alison Hume in 1:57, Dominic Lyes in 2:00, and Iris Mayo in her first 20k, 2:25. At Gloucester 20 mile race, Richard Birch was the first Almost to finish in a rapid 2:15. Next was Shaun Carr with a PB in 2:19, then Hattie Jenkins in 2:22 and Ross Greening in 2.36. There were PBs for Amy Sheer (2:39), Mike Daly (2:42 and 3rd in his age category), Catherine Daly (2:50) and Natalie Greening (3:00). Also running were Kieran Keating (2:42), Dave Chittock (3:00), Steve Wallbridge and Hayleigh Woolnough (3:10), Sharmila Door (3.48), Alison Gregg (3:52) and Jane Birch (4:09). Allan Green continues to add to his impressive marathon tally with the Enigma Running Week at the Knees Marathon (5:03) and Wrexham marathon (5:24). Also battling through floodwaters at Wrexham was Ingrid Harris, who took 3rd in her age category in 3:49. Ellie Laney-Bolton and Jamie Courtenay completed the popular Bath Half Marathon. Laney-Bolton finished in a swift 1:29, narrowly missing a PB. Courtenay finished in 1:39. Gemma Stevens ran the Reading Half Marathon in 1:54. There was the usual strong Almost presence at local parkruns, with runners at Cheltenham, Gloucester City and Tewkesbury. Hester Coggin was 6th lady at Kingsway, and Jo Foster 8th lady at Gloucester North. There was tourism for Kim Davenport and Darren Lewington at Southend, Kasha Price at Poole, Matthew Bevan at Upton Court and Phillip Jukes at Kingsbury Water. Peter Jones ran at Stretford, Mike Bryce at Chipping Sodbury, Claire Hawes at Exmouth, and Danny Carroll at Haldon Forest. Alan Mercer covers 90 miles underground! Extreme winds and heavy rain made racing conditions a challenge over the second weekend in March. Nevertheless, members of Almost Athletes successfully competed in a number of different events, both home and abroad. Six Almosts took part in the Minchinhampton 10km event on Sunday, with Michael Harris the first Almost to finish in 46:39. Pete Blakeman came home in 50:02, Jenny Combellack in 50:47, David Garnett in 51:50, Philip Withers in 57:52 and Adrian Courtenay in 1:08. Martyn Fisher ran a very muddy Harpenden Half Marathon in 1:56, whilst Julianne Jameson completed the Draycote Water Half in 2:06. Three Almosts – Karla Cleverley, Steve and Helen Yarnold - travelled to France to take part in the Paris Half Marathon. Despite the French authorities removing signage before the end of the race, they crossed the line together in 3:12. Ingrid Harris came home as 3rd lady overall and 1st in her age group at the Larmer Tree Marathon in the Wiltshire Downs with a time on 4:21, whilst Helen Fursman Reid ran the 20 mile event in 3:38. Allan Green notched up another marathon by completing the Thames Meander Trail event in 5:19, whilst Alan Mercer ran an incredible 90 miles in the Bath Combe Down Tunnel Ultra – the longest underground race in Europe. At Cheltenham parkrun there were top ten finishes for both Matt Polson and Shaun Carr. Polson came fifth in 19:04 and Carr was 10th in 19:37. Ben Taylor came second in the Newent parkrun with a time of 21:16 and Chris McMahon got a new course PB at Gloucester City with 23:30. The sun was shining in Bourton on the Water, as over 70 Almost Athletes competed in the popular Bourton 10k race, famous for its fast and flat course. There were PBs aplenty, with winter training and marathon preparation paying dividends for several Almosts. First Almost across the line was Matt Polson, shaving over a minute off his PB to finish in an impressive 36:56. Next home was Simon Jarvis, also with a PB in 37:21. He was followed by Martin Foster (37:37), and Nick Lewis (38:00). Shaun Carr goes from strength to strength, knocking 3 minutes off last year's time in 38:58. Helena Youde was first Almost lady home in 39:33, followed by Hattie Jenkins in 40:15. Jeanette Gullick ran 42:51 to gain a PB and finish 3rd in the FV50 category. There were age category wins for Karen Galpin with 45:41 (FV55) and Sheila Chatterley with 54:43 (FV65). The race also brought PBs for Phillip Jukes (40:03), Robert Dalton Morris (42:05), Piotr Michalski (42:24), Richard Knightley (47:14), Louise Bryan (47:25), Gregg Woodman (49:46), Natalie Pluck (53:24), Nikki Durnell (56:11), Deborah Elliott (56:15), Wan Hartley (56:37), Hannah Brown (56:53), Sue Monaghan (56:54) and Iris Mayo (65:10). The event marked Ollie Nolan’s return to racing, just two months after surgery to remove a brain tumour. He crossed the finish line in a remarkable 70:59. Also making a comeback following surgery was Seth Gilbert (71:42). Elsewhere, Josh Hand was in incredible form at Wokingham Half Marathon, flying around the course in 1:18 and finishing in the top 100. Ingrid Harris and Allan Green were in action at the 100 Club AGM Marathon, Staffordshire. Harris completed the eight lap course in 3:48, followed by Green in 5:31. John Bailey and Paul Turner travelled to the Peopleton Duathlon in Worcestershire, where fog saw the cycle stage being cancelled. They finished their running events in 49:35 and 34:34 respectively. Andrew Wilkinson was also defeated by the weather as he waved goodbye to Cheltenham and set off for Malta. His plans to tackle the Malta Marathon on arrival in his new home were thwarted as wind and rain saw the event called off. There was the usual strong Almost presence at parkruns across the region. Shaun Carr was 9th at Cheltenham (19:30), Jeanette Gullick was 4th lady (21:43) and Helena Youde was 8th lady (22:36). There were celebrations at Gloucester City’s first birthday event where Christopher Benjamin was awarded for his enthusiastic volunteering. Meanwhile, Charmaine Brunt ran 24:25 to finish 7th lady. Kingsway saw Hester Coggin take 4th lady (22:47) and Ben Taylor finish 10th (19:38). Josh Hand was 10th at Tewkesbury (24:19) and Lousie Inchley took 5th lady at Minehead (27:03). Further afield, Rachel Fargher, Malc Smith, Janine Bennett and Kate Freeman travelled to Severn Bridge. Rich Smith was at Burnham and Highbridge, Joanne Wisniewska Barretto and Vasco Barretto at Worcester Pitchcroft, Danny Carroll at Churchfields Farm, and Bill Jones at Swindon. There was also tourism for Piotr Michalski at Briston Eastville, Martyn Fisher at Market Rasen, Mike Bryce at Henley Wood, David Nelson at Strathclyde, Robert Foord at Stretford and Phil Jeyes at Bideford.